1. Gelbisons: Gelbisons is a Bondi Institution which was firing up the wood fire oven long before the organic-living hipsters migrated to the sunny shores of the east. The restaurant is loved by locals and families, because it is cheap, easy and BYO, perfect for a mid-week dinner or a party with pigs. The pizzas are perfect - thin base and minimal ingredients done well and paired perfectly. 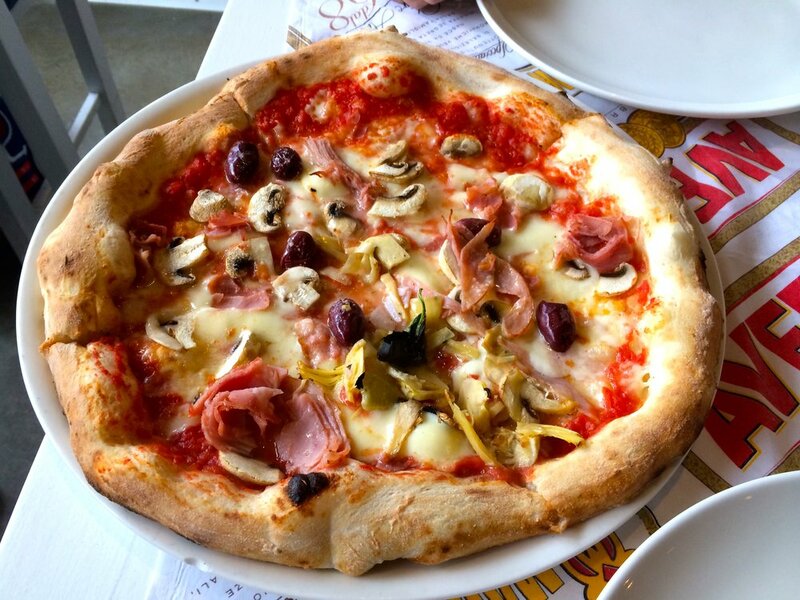 My go-to is the Valese pizza which is topped with sundried tomatoes, artichokes and slices of cured ham rolled on top. Get to Gelbisons, you won’t regret it! This hole in the wall does things a little differently. Behind the counter is a large cabinet with a delicious looking selection of cured meats and delicious cheeses, which are sliced right in front of you before being placed in their fold over pizza pockets. They are the perfect portion, ideal for curing a craving without feeling like a porky pig. They have a nice little wine menu, or BYO – the optimum spot for a casual dinner, but not with too many pigs because seating is limited. The house it the white building covered in vines with the inside walls adorned with wine bottles, the idyllic setting for a slice of pizza (or 8). The pizzas here are reflective of the venue – simple, beautiful and full of the best ingredients and perfectly prepared. My favourite is the Danielle Pizza, a thin crust base with light lashings provolone and parmesan cheese, fresh asparagus and crisp prosciutto, all subtly lathered in a truffle oil, oink oink! The corner house is the home to the perfect cocktail too, so pack up the pigs and watch the world go by from their upstairs bar on Bondi Road. Pompei has been featured on many “Best Pizza” lists for Sydney, and it is no surprise why. The owner, George Pompei, sources the best, freshest ingredients locally, a few secrets sourced from Italy and more than a pinch of passion to ensure perfect pizzas are plated up. Try the bresaola e rucola with air-dried beef, rocket, tomato, fior di latte and parmigiano or the saporita with goat’s cheese, wood-fired peppers, olives, tomato, both will have you coming back for me. Pompei is also famous for its gelato, which is made in house - the perfect sweet treat to top off a great feast! Not only does Da Orazio have the best pizza, it is one of my favourite restaurants in Sydney. Their bases are handmade in house and topped with fresh ingredients and a a little on the sloppy side... just the way I like it. For something different, order the porchetta pizza sandwich, it is life changing!